Are you sure you want to move this file to the Recycle Bin? If you just upgraded to windows 10, or recently got a new Windows 10 computer, you might notice something a little bit strange while deleting files or folders. They just disappear. Pressing the delete key or right clicking and choosing delete will instantly delete the file, no confirmation whatsoever, no “Yes/No” dialog box. This is the default behaviour on Windows 10, unless you change it, and the reason I have written this article is to show you how. Interestingly, the deleted files / folders are not hard deleted. They are only moved to the Recycle Bin, thereby eliminating the extra step of having to click “Yes” on the “Are you sure you want to move this file to the Recycle Bin?” dialog box. Whether this is a good feature or not is left for you to decide based on your own personal usage. Here’s a couple pros and cons based on my own personal judgement, and then I would show you how to enable the confirmation dialog. Straight to the point — For people who despise redundant tasks, this feature might be gold. Might save people from bad decisions — Some people (like me) rarely use the Recycle Bin. Honestly if I come across a file I am certain I won’t need anymore, I quickly do a CTRL + DEL and be done with it. It doesn’t sound cool to me that the file still takes up space on my hard drive even while residing in the recycle bin and would be double work having to delete it twice, so I just hard delete them on the spot. This might not be a good idea though as people tend to make bad decisions during anxiety, anger or depression. Low key moving deleted files to the Recycle Bin might just be a saviour. Accidental deletes and Kids — An accidental tap on the delete key, kids tapping on keys in your absence. e.t.c. Accidentally deleting important project files might cause the victim to jump off a bridge or destroy a laptop without thinking to look in the Recycle Bin first since there was no notification of its new location. One of the laptops I once used at work had a faulty delete key that would randomly get stuck and click on its own. This was around the time I was just starting out with Windows 10 and had no idea. It was horrific when files would just randomly disappear in front of me, including system files, and I had no idea where they went until I looked in the Recycle Bin. 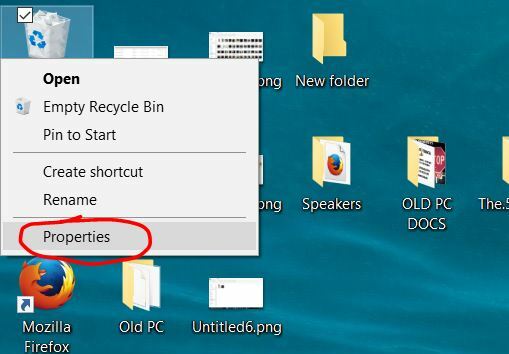 On your Windows desktop area, find the Recycle Bin icon. Right click on it to bring up the context menu. In the Recycle bin Properties window, Check the box that says Display delete confirmation dialog. Then click OK to save. 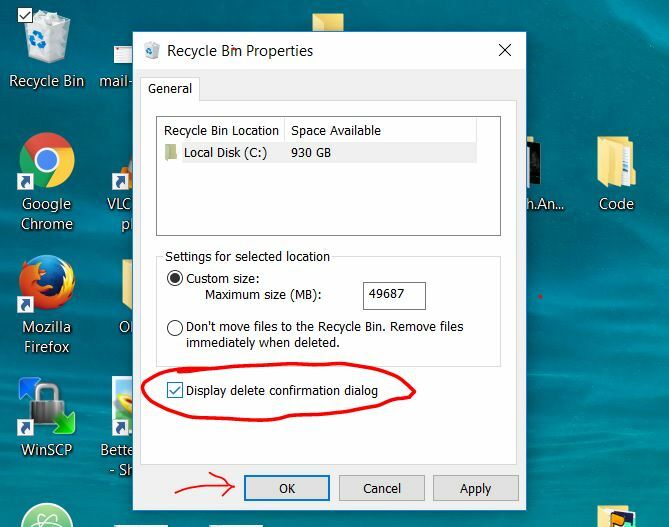 Now when you try to delete a file, the good old delete confirmation box pops up, and would only move the file to the recycle bin if you click Yes. If you click No, nothing happens. Thanks for reading. If you have any questions, you can leave them in the comments I will to my best to respond as soon as possible.